Made in response and as an ode to one of America’s foremost groundbreaking performance artists, performance artist Jess Dobkin’s newest work, How Many Performance Artists Does it Take to Change a Light Bulb (For Martha Wilson), is at once a question, a joke and a reflection on the ways we see. A: I don’t know. I left after 4 hours. A: One to change the light bulb and 40 to document it. 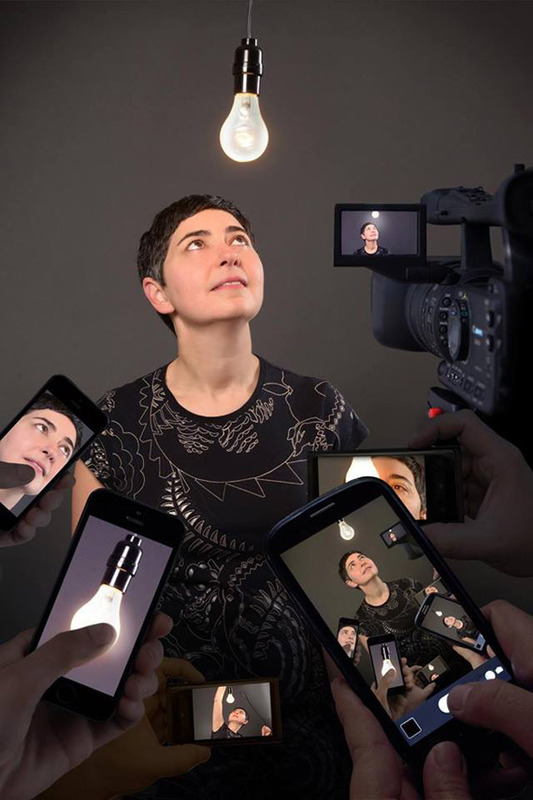 As a manifestation of these jokes, and as a reflection of our screen-dependent culture, Dobkin has developed a four- plus-hour durational performance where a performance artist (Dobkin) will change a light bulb with at least 40 people documenting the piece through an exhaustive list of forms. From the ever-present phone camera, social media fanfare and GPS locator, Dobkin also turns to the generations of how performance art has been documented, revisiting the various models of photo- graphy, video recording, film formats, drawing, writing, along with treaded analogue technologies. How Many Performance Artists Does it Take to Change a Light Bulb (For Martha Wilson) will be an attempt to overwhelm the definitions and intersections of performance, documentation, the archive and image reproduction to investigate the nature of performance itself. form and quality of the documentation impact our under- standing of the original work? How have technological advances in documentation and image making changed our understanding and definition of performance art practices? Performed by Jess Dobkin and 40 volunteer documenters, with special guest appearance by Martha Wilson.